They can watch everything that is going on, and they spend the winters in there safe from all the wind, rain, sleet and snow. There is a branch just above and one below, and I would see them many a time sitting there just watching me fill the bird feeders. You can Achieve Harmony in Your Yard if you Supply Both Bird and Squirrel Feeders in Different part of the Yard. They used to make a mess of my bird feeders because they didn't really like the mixture, it was the sunflower seeds they were after, so they would get on the feeder and spray it everywhere. Make Peace and Enjoy All the Critters in Your Yard!! I tried oiling the pole, and when I saw a squirrel actually kicking dirt onto the pole so he could shimmy up, I knew it was time for a different approach. I didn't want to spend all my spare time chasing them away, and when I really looked at them, I thought they were cute, especially when their little ones were allowed out of the nest. We backed on to a park with huge nut trees, so I knew the squirrels and chipmunks were not going away anytime soon. "So, if you can't fight them, then make peace with them, and this has worked for me". So, if you can't fight them, then make peace with them, and this has worked for me. 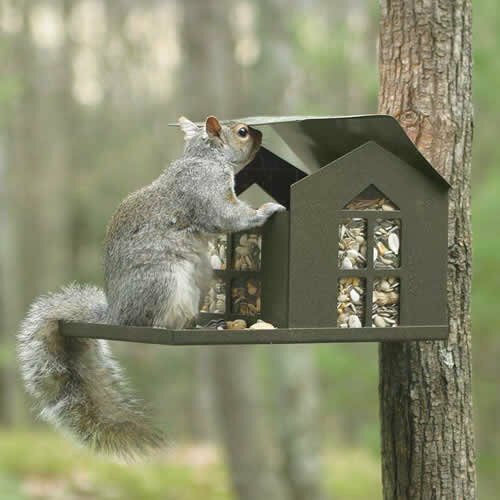 Below are a few squirrel feeders you can get online, just click the image or the title or check out my squirrel feeder page for some really cute feeder ideas. 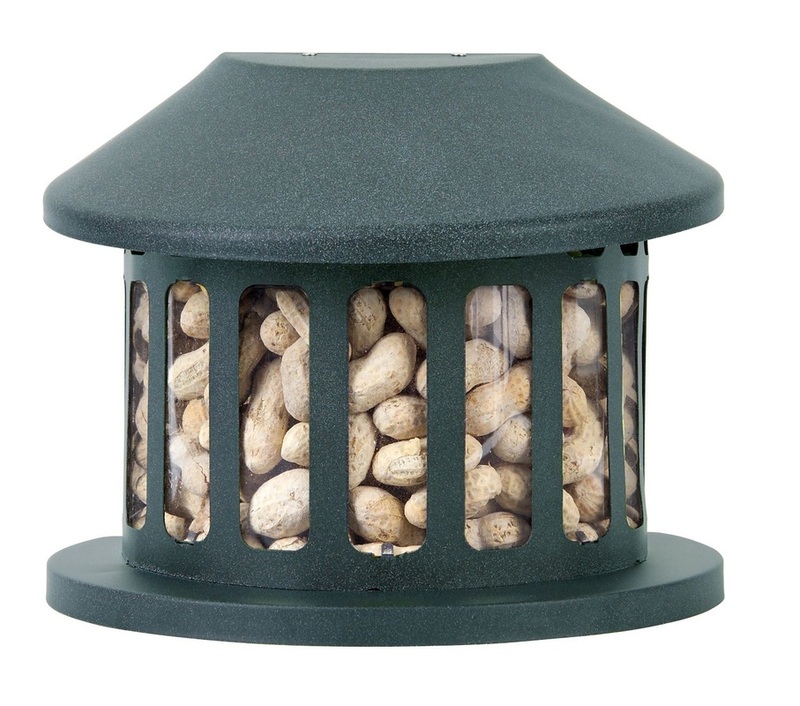 These feeders are perfect to hang in a tree or somewhere further away from your birds. Fill them with peanuts in the shell and squirrels and chipmunks will love it, even the occasional blue jay will enjoy them too! You can get some really good deals online for a large bag of peanuts in the shell for your squirrel friends. This feeder is really cute as the squirrel or chipmunk lifts the lid to "raid" the peanuts. It seems to make them feel like they are rummaging for the food and because they are naturally nosy, they will be drawn to it. I personally love the idea of making them work just a little bit for their food. When they have to tug and pull and rummage it gives their teeth a good workout. If you feed them peanuts in the shell they have to use their teeth to get the prize out of the shell which is also good for them. You can get specialized feeders such as the ones above (just click on the pictures or the links) online where there are many styles to choose from, whether you have a tree to hang these from or a pole they can be fun to watch. Try to put some distance between the bird feeders and the critter feeders to keep harmony. You can also try retrofitting an old bird feeder to work for peanuts by opening the holes up a bit more, if you just want to try it out before buying anything. But remember to keep it full and make them work just a little bit so they don't go through the food too fast.